The Z’s right rear brake drum (pictured above) decided to seize up a few weeks ago. The wheel cylinder was evidently on its last legs, and after one too many applications of the parking brake, refused to unclamp the shoes from the inside of the brake drum. So, I can remove the drum from the hub (the typical challenge) just fine, but the shoes are still dug into the drum like a pair of rabid pit bulls. I’m going to try a few more tricks tonight. In related news, I hate drum brakes. In the wake of my tactical adjustment detailed in the last post, I’m assembling a spreadsheet of parts I need in order to try to start the engine. I’ve been using this site as a part number reference, with the understanding that not everything I need has to be new from Nissan. In particular, wear items like brake pads and shoes and other bits like brake and clutch master cylinders can be remanufactured items. It’s been a challenge compiling part numbers and prices, but I’m slogging my way through it. The removal of the wheels for brake service presented me with the opportunity to take some measurements. I was pleasantly surprised to find they’re wider than I thought they were, at 14 by 7 inches. The stock tire size is 195/70-14, but on a 7-inch-wide wheel I could go all the way up to a 225/60-14 without trouble, which is a lot of rubber for a 2350 lb car. 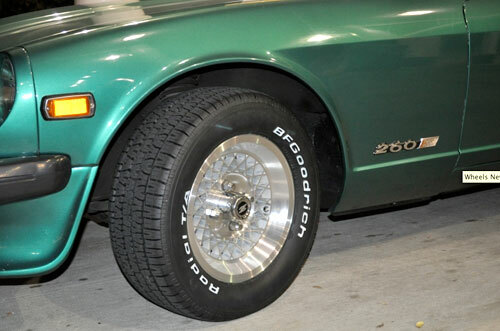 I have a soft spot for vintage muscle car tires with raised white lettering, so what I would like to do is acquire a set of BF Goodrich Radial T/As (shown above). They would complement the look and feel of the car perfectly. But…we’ll see whether those are in the cards. ZTherapy received my carbs yesterday and, as expected, diagnosed the carb bodies as being too far gone to salvage. The company’s been under new management for the better part of 10 years now, after 5 or so with the original owner (who originally rebuilt my carbs), and has spent an inordinate amount of time repairing units damaged by the original owner’s remanufacturing process. The upshot for me is that reconditioning them will be more expensive than I had anticipated, but the new techniques used in adding the bearings to the throttle shafts (ZTherapy’s signature service) will last the life of the carbs; in other words, indefinitely. Is there such thing as a disc brake conversion for that car? 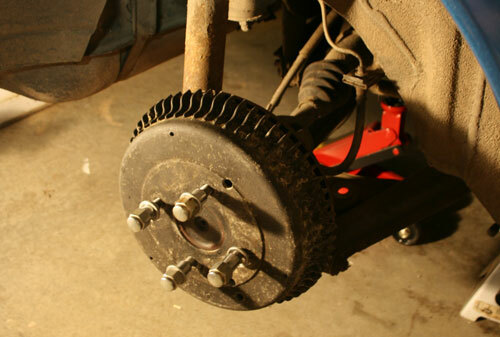 I’m not a fan of drum brakes at all…not matter how old (or light) the car is. 205/60-15s would work and enable me to keep closer to the stock 25″ wheel diameter. I’d have to buy new wheels, though—at the moment I want to try to make what I have work. Hi, what are the names of the wheels you have on your Datsun in the picture above? I really like the look of them. Is the bolt pattern 4×4.5? Thanks! Hi Miles. That’s not my car; I was just displaying the tires I wanted, so I don’t know actually know what wheels they are. They look like they’re 15″, and the bolt pattern looks to be the stock early Z pattern: 4 x 114.3mm or 4 x 4.5″. Thanks Matt, do you remember where you found the picture? Maybe it will give me a lead on those wheels. Great work on the Z by the way! So what did the wheels actually measure, 7 inches wide? If so they are 14×6 wheels, a 14×7 is real close to EIGHT inches wide! Just wanted you to know that, it would be a six inch wheel if it measures seven inches. I could tell from the pics that they are not 14×7 as they would have an inch deeper dish. I had a friend install wide rubber on a wheel that was too narrow…..the result was a blow out and totaled vehicle. I just fit 225/60-14 BFG on my 14×8 (measured) five slots, they hit the valance corners and the fenders, so i will have to back off to 195 or 205. You have the better combo, cheers! Gotcha. During the brief time I took the Z out with the new tires on, they didn’t hit either the fenders or the valence, but to my recollection I neglected to turn the wheel to full lock in both directions to check. Could be my wheels’ offset is different (read: higher) than yours; that could account for the difference.